What did you love best about In Sheep's Clothing? It sheds light that those victimizing others may not always do it as response to childhood abuse or insecurities, but rather because their behavior has worked for them for so long as a resource in competitions, coping, or achieving, thus they continue the behavior. What other book might you compare In Sheep's Clothing to and why? Emotional Vampires- This will help understand and consequently identify traits in others, such as the narcissist, blackmailer, or drama queen. The voice was just about right for this type of audio book and gave listener ease at focusing on what narrator was presenting. I did giggle a bit, at a few moments, when he tried mimicking husband/wife scenarios, and their voices. There were quite a few 'aha!' moments as I learned traits of personality types, how they might end up with each other, and why. Very enlightening. I think this is a great listen for those that may be confused, cant quite figure out why relationships are not as one would like, or wants to understand more about motives behind certain behaviors.The author provides an unbiased review so listeners can understand traits that affect communication, jobs, and relationships. We have all been victimized by manipulators. 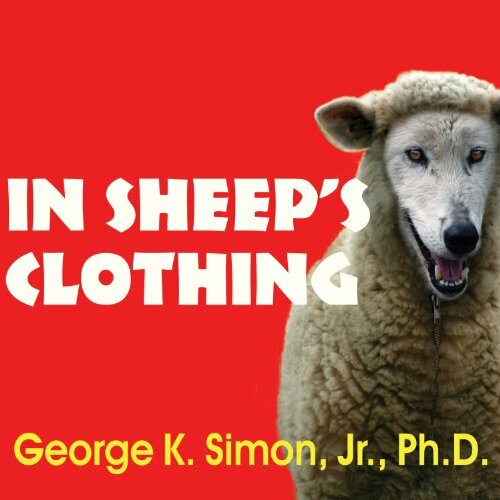 George K. Simon sets out in his book In Sheep’s Clothing to shed light on manipulators and reveal what can be done to protect ourselves from those persons. He also applies current thinking and research on manipulative behavior to these relationships. This is not a self-help book though it will provide much help individuals can use. This is rather, a book on manipulative behavior from which readers can make applications where they might personally apply. Simon doesn’t write about adults, but also includes children and teens who might be manipulating their parents, teachers, or others. The book particularly helped me to recognize when I might be the target of manipulation and how I should behave in return. A few passages rely on psychological terms which may put some readers off. However, they are minor and should not detract from the overall benefit available to the reader who pays attention. Readers who are looking to understand WHY manipulators do what they do, may be disappointed. Readers seeking to recognize manipulation when they experience it will be justly rewarded. The reading of Kevin Foley is ery good. I think I misread the blurb for this title, or the title itself. In my professional life I deal with a number of people that I think fit the description "manipulative". I cross examine them, negotiate with them and take instructions from them. I thought this book would help me understand where they are coming from and help me to deal with them. That was not entirely correct, but that was my mistake. It is really about learning about what most of us are inclined to be predisposed to and how others take advantage of the predisposition. It really comes down to what the author means by "manipulative". For all that, I found the book very informative and I did (inevitably) see the ghosts of acquaintances and girlfriend's past in the illustrative examples. That was interesting and educative to the point of wanting to learn more. So success from a false start, but success none the less. On reflection, this is a better guide for dealing with interpersonal relationships that it is for dealing with professional ones, but the classes are not mutually exclusive. There was nothing wrong with the narration and nothing that grated on me other than the occasional strange pause, but I attribute that to post production, not to the narrator. Finally, and for the record, I think lawyers are a sub-class of covert-aggressive and obsessive compulsive personality types, rather than the channeled aggressive sub-type argued for in the text; but then again, I would say that according to the author's theory! First of all, go read all the gorgeous reviews on amazon for the printed version. It's a very popular book. In short, it goes into describing toxic people, their strategies for manipulating others and the weaknesses they exploit. And it offers strategies for dealing with them. The reason I think this book is a must read is because we come across these toxic personalities more often than we think we do. They can really destroy your life in a very subtle way, so that you would barely feel this. The book offers an essential knowledge that any good person needs in order to survive. No matter who you are, a businessman, therapist, or school teacher, in time will find your life impacted my those who would try to manipulate you. Some people use manipulation in rare instances to gain temporarily advantage, however, others will manipulate often, often without others knowledge. To that end, it is important to understand the traits of manipulative people and to learn their techniques. George Simon has created a book designed to help therapists and non-therapists alike understand and learn to survive around manipulative people. By reading this book, you will gain tools to better understand and survive around manipulative people. Would you listen to In Sheep's Clothing again? Why? Yes, to learn by heart the strategies offered in this book to manage the umpredictability of character disorders. There was no favourite character since this is not that kind of book. But I must praise Dr Simon for his uncanning insightfulness into the human psyche. The clear and frightening description and vignetes about covert agression and manipulation. It was like revisiting some of my life experiences with some very disturbed characters. This is a must read or listen to 'amazing book'. It equips individuals to identify and take protective and affirmative action in the presence of manipulation and covert agression. It clearly describes the typical characteristics of individulas with character disorders and their modus operandi. I would recommend this reading even to young people (over 16). The contents of this book also serve as a mirror to the reader to assess her/his own character and behaviors in the light of individuals who habitually fall on manipulation tactics and covert agression. No human being is immune from practising agression or manipulation at some point in their lives. However, there is an abysmal difference between the habitual practice of covert agression and manipulation and the odd use of the latter. This book aims and does expose the habitual covert agression and manipulation that pervades across all social sections of the population; from family, school, friendships, workplace and the list goes on. I have felt not only equiped to manage manipulative situations but also I felt liberated as I understood aspects of myself that required change to survive the attacks of manipulative and agressive individuals. It is impossible to change covert agressors and manipulators, specially those who have made an art of their craft. However, it is very possible to change oneself as we identify, resist, confront and denounce manipulation. As Dr Simon says, there are consequences when one takes decisive action. Individuals with character disorders as such do not take kindly being confronted as they dislike 'to loose'. However, the cost is worthwhile. Drawing a line in the sand is necessary to be able to survive psychologically and emotionally in society. There is a saying that goes like this: 'if you don't stop yourself, others will'. We live in a heard-like society. It is time to stop those who cause so much havoc in society and in numbers of good individuals there is power. As Dr Simon states, there has been a misconception about the perception of character disorders and this is changing now. Let us call manipulation when we see it as such, for it is an attempt to gain ground and a higher position of dominance over others. Let us uncover covert agression and name it for what it is, a way to intimidate others into submission. I had high hopes reading this book. I thought it might help me at work as I deal with manipulative people and every once in a while I find myself wishing I had put up better boundaries. However I found this author to be too simplistic in his analysis of others intentions. It was as though he found most people to either be good or bad. He would summarize one person as the victim and one person as the aggressor. As I listened to his examples on the aggressive/manipulative people I found myself wanting to ask, why are you assuming that this person is only the aggressor? The examples demonstrated more complexity when you read between the lines. As an example there was a young girl who was verbally abusive to her mother and refused to follow her mothers instructions. They both had been abused by the husband who was out of the house during therapy. He decided that the child was the manipulative person and the mother was a constant victim. When in fact the mother had failed to protect her child and her child was acting out because she was angry at the mother. In my opinion they were both victims and both aggressors. I didn't find the author had a grasp on the complexity of human interactions. So it was hard to take the rest of his recommendations to heart. Covert Aggressive Personality Disorder: Sometimes you get the key to a code which gives an AHA! moment. We have ALL dealth with difficult people and wondered how to handle them, but like a ghost in the night they can be very elusive and very tricky. Firstly one has to get over self doubts and realize that these creatures exist. After that one has to identify who they are and how they play their games. And their games can be very nasty and toxic indeed and build up to a fatal destructive level. This really is a pernicious relationship destroying problem, which needs to be recognised and controlled post haste whenever it arises, if harmony is going to be restored. The point is to realize it and recognise it. I gratefully thank the author and also recommend "Working With Monsters' by Dr John Clarke as an enlightening source of further reading. Don't be a sucker. There. I've just saved you from having to listen to this book. The basic idea is that some people are just bad because they want to be bad and they are not going to change. We need to stop thinking that their misbehavior is actually some misguided, inappropriate attempt to meet some unmet childhood need. Most of the book is spent debunking that myth. This book basically gives people permission to write these destructive personalities out of our lives, to understand that we can not change them. There's no magic to identifying them. The rule of thumb is that if you get that vibe, then you're probably right. That's it. Everything else in the book is fluff and filler. 91 sur 110 personne(s) ont trouvé cet avis utile. There are so many ways people can be covertly aggressive. I had a coworker once that hid one or three of my files at a time, sometimes for a few days - and sometimes for months. I thought I was losing my my organizational abilities and maybe my mind, until someone found my files in her office, hidden at the bottom of a pile of her own files. I confronted her, and she laughed it off, claiming it was an accident. Yeah, right. I spent the next 18 months I worked with her, periodically inventorying my files to make sure no more "unfortunate misfiles". There were, of course, along with a bunch of other "problems" that miraculously ended when I stopped working with her. George K. Simon, Jr.'s, PhD's "In Sheep's Clothing: Understanding and Dealing with Manipulative People" (1996, 2010) describes what this person was: covertly aggressive. The first part of the book explains why someone might behave this way. One explanation is what Simon calls a character defect, such as psychopathy. The DSM-V (Diagnostic and Statistical Manual of Mental Disorders, 5th Ed. 2013) uses the diagnosis 'Antisocial Personality Disorder', but I think Simon's use of 'defect' is more apt because a defect implies a permanent flaw which might be hidden, but cannot be fixed. Another reason someone might be manipulative/covertly aggressive is Narcissistic Personality Disorder, another DSM-V disorder, although that can be treated. Regardless of the reason a person is manipulative, Simon emphasizes that in order to prevent being manipulated, boundaries must be firmly established and maintained. Someone who is empathetic, especially overly empathetic (Simon uses the out-of-favor term neurotic) is much more at risk for being played, because an empathetic person attributes mental disorders to bad nurturing and circumstances. Simon addresses manipulative children and teenagers, but I don't agree that this indicates mental disorder, since all kids are manipulative to some extent. The guidelines he suggests are applicable for normal childhood and teen stages of development, though. The book has a definite academic bent which makes it stronger than pop psychology books that are long on anecdotes and short on explanations. And I don't know why the person I worked with was the way she was - but now I know I handled the situation the best way I could have. But Audible, Audible, Audible - why no Table of Contents? It would be so helpful with this book. Here it is (with thanks to Amazon): PART I. Understanding Manipulative Personalities. Introduction: Covert Aggression: The Heart of Manipulation; Chapter 1. Aggressive and Covert-Aggressive Personalities; Chapter 2. The Determination to Win; Chapter 3. The Unbridled Quest for Power; Chapter 4. The Penchant for Deception and Seduction; Chapter 5. Fighting Dirty; Chapter 6. The Impaired Conscience; Chapter 7. Abusive, Manipulative Relationships; Chapter 8. The Manipulative Child; PART II. Dealing Effectively with Manipulative People. Chapter 9. Recognizing the Tactics of Manipulation and Control; Chapter 10. Redefining the Terms of Engagement; Epilogue. I had a problem with Kevin Foley's narration - he was the audio doppelgänger to a narrator of a 1950's Army training film on surviving a nuclear bombs that I watched in basic training. I spent the first hour of the book wondering if at some point I'd be told to turn away from the flash and lie flat on the ground. I was able to listen past the association, and I'm sure other people will like the narration better than I was able to. 54 sur 66 personne(s) ont trouvé cet avis utile. P.S. : a super great book for anyone in or coming out of abusive relationships with partners, family or coworkers. this book is a sheep in wolves clothing! just a collection of bullet points with occasional cheesy, unidentifiable stories about middle class white Americans from a time long, long ago. Speakers voice sounded like a talking clock, although it was very amusing hearing him do women's and children's voices- I laughed out loud on the train. if you are dumb enough to be helped by this glorified kids book, then you are in big trouble. the manipulators of this world will eat you for breakfast!